The burner inserter is the most basic and slowest type of inserters. It is powered by burning fuel, compared to the more advanced inserters which are powered by electricity. It will add fuel to its own supply if it picks any up, which makes it useful for filling boilers with coal. This has the advantage that it will continue working even if the power fails, as opposed to electrically-powered inserters which will be unable to function. It consumes no fuel while idle, though it consumes vastly more energy than comparable inserters when active. A burner inserter sometimes cannot grab moving items from either red belts or blue belts. 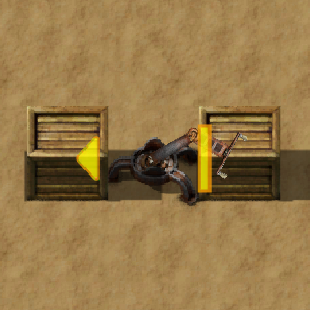 It also cannot grab moving items from turning belts if the item is on the far side. It will try, however, and consume fuel in its attempts. Even though it doesn't use electricity, a burner inserter can be connected to and controlled by the logistic and the circuit network. A burner inserter consumes no power while idle and do not continuously consume the maximum amount of power when working, so how long fuel lasts can be measured by how many times an inserter can swing back and forth. A burner inserter fueled with coal can swing 57 times, transporting 57 items at a inserter stack size of 1, while a piece of wood lasts 28 swings, and solid fuel lasts 178 swings. From these experimental results it can be concluded that 1 MJ of fuel lasts between 14 and 14.25 swings, which is close to the actual number of 70 kJ / 1 swing. Inserters are able to squeeze things slightly better to belts. Burner inserters start with enough energy to pick up 1 item and fuel themselves.